This article is about the Game & Watch game. For the WarioWare: D.I.Y. microgame, see Greenhouse (microgame). For the room in Luigi's Mansion: Dark Moon, see Greenhouse (room). 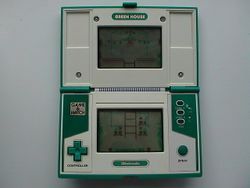 Greenhouse (released as Green House) is a dual-screen Game & Watch game released as a part of the Multi Screen series on December 6, 1982. It is featured in the Museum in Game & Watch Gallery 2. It was later remade for Game & Watch Gallery 3, with a Classic version and an updated "Modern" version. The player controls a bug exterminator only referred to as the "Fumigator" in the manual, and the objective is to spray worms and spiders that try to eat the flowers in a greenhouse. The worms crawl along vines on the top screen, while the spiders crawl along webs on the bottom screen, and the player will have to try to hit them with a bug spray before they reach the flowers. A ladder connects the two parts of the game (which otherwise offer almost identical action). The player receives a point for killing a worm far from a flower, two points for a worm one step away from a flower, and three points for a worm closest to a flower. To kill the spiders, however, the player needs to spray them closest to a flower. If sprayed farther away, the spiders back away one step, which gives the player a point. When the player kills a spider, they earn three points. As the game progresses, the worms and spiders will move faster. If a worm or spider reaches a flower, the flower will die, earning the player a miss. If the player gets 300 points without any misses, all points will be worth double until the player does get a miss. If the player has any misses at said score, all misses will be canceled instead. When the player gets three misses, they receive a Game Over. In the Modern version of the minigame, an Orange Yoshi has to protect its flowers by spraying Fly Guys and Grinders with Watermelon seeds (as it did in Yoshi's Island). In this version, a Warp Pipe connects the two parts of the game. The Yoshi earns a point for defeating a Fly Guy and three points for a Grinder. In addition to the points earned for defeating the enemies, the Yoshi receives a point for every Watermelon it eats. Once the Yoshi grabs ten Watermelons, it will gain fire-spitting powers, allowing it to burn the ropes of the Grinders, scorching them even while they are shielded, and the Yoshi will earn three points for defeating a Fly Guy. The tulip that releases stars from Yoshi's Island releases the Fly Guys. If a Fly Guy or Grinder reaches a flower, the enemy will jump on it and kill it. At 200, 500, and 700 points, a Heart will appear for the Yoshi to remove a miss. Music is also featured, with the tempo changing depending on the speed of the game. However, in this version, the score and miss marks alternate positions depending on the section the Yoshi is standing on. In the Nintendo DS game for Club Nintendo members, Game & Watch Collection, there is an exact port of Green House, alongside Donkey Kong and Oil Panic. In a 1983 Game & Watch commercial, the Fumigator is called "Stanley," which is the name of the playable character featured in the Donkey Kong 3 arcade game released that same year. 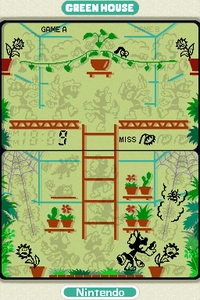 Donkey Kong 3 is also set in a greenhouse and has similar gameplay; however, Nintendo has never officially connected the two titles, and Stanley does not resemble the Fumigator. In the Super Smash Bros. series, Mr. Game & Watch uses the bug spray from this game as his standard attack. The timer has a maximum capacity of 19 minutes and 59 seconds, though it is unknown what happens when the timer ends. This page was last edited on April 11, 2019, at 19:07.